Amritsar Sahib: In the concluding phase of his state visit to the Indian sub-continent, the Canadian Prime Minister Justin Trudeau along with his family today arrived at Shri Guru Ram Das International airport, Amritsar Sahib to pay their obeisance at Shri Darbar Sahib. 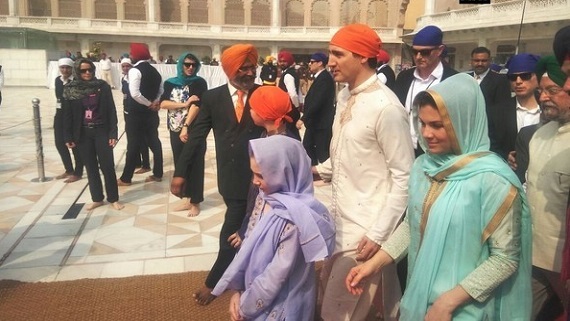 Wearing an off-white kurta-pyjama and head covered with a “kesari” (saffron) pattka, Justin Trudeau entered the Darbar Sahib complex with his wife Sophie, who was wearing a turquoise kurta, and their children, who were also wearing traditional Punjabi outfits. 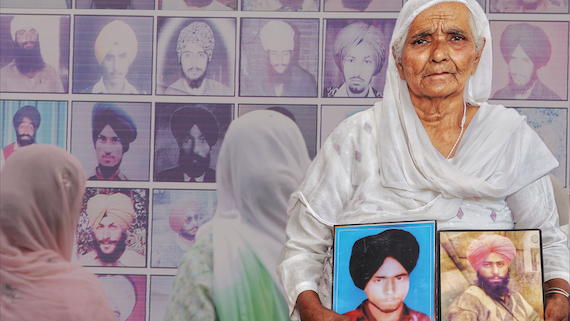 It was reported by the media sources that slogans (Jaikare) of “Bole So Nihal, Sat Sri Akal” were heard as the Canadian Prime Minister and others entered the complex housing Sikhism’s holiest shrine. The Canadian Prime Minister also did “parikarma” before entering the sun-soaked and glittering all-gold sanctum sanctorum. The family bowed before Shri Guru Granth Sahib. Justin Trudeau and family performing ‘seva’ at the Darbar Sahib. 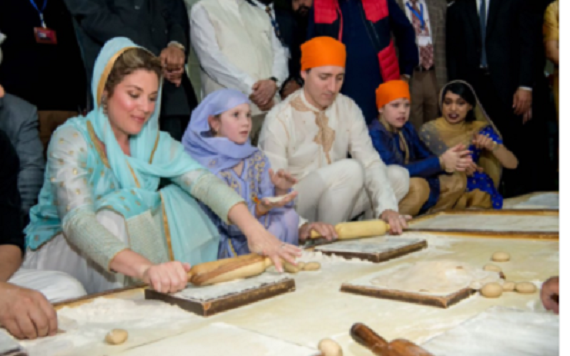 Afterwards, Justin Trudeau and his family proceeded towards the “Langar Hall”, where thousands of devotees partake langar (community food) and also did “sewa” (voluntary service). They reported said down on small stools inside the Langar Hall to knead flour and roll chapatis. He was accompanied by Canadian federal ministers Harjit Singh Sajjan and Amarjit Bains SGPC chief Gobind Singh Longowal and SAD (Badal) chief Sukhbir Badal were also accompanying him during his visit. 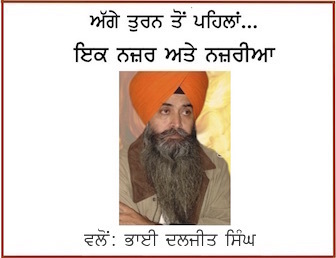 Apparently, he had asked local authorities to let him and his family enjoy the spirituality of the Darbar Sahib during their visit, reads a quote from a report published in an English vernacular. Furthermore, after concluding his visit to Shri Darbar Sahib the Canadian premier is expected to have a short meeting with Punjab Chief Minister Amarinder Singh.